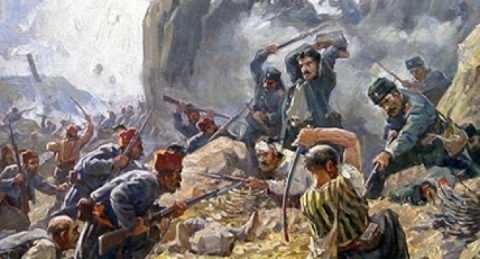 The Shipka peak in the central Stara Planina mountain was site to some of the most fierce and pivotal battles in the Russo-Turkish war 1877-8, which lead to the liberation of Bulgaria from the Ottoman Empire. Thousands of Bulgarians paid homage to the Shipka National Memorial on March 3, Liberation Day. Sunday thousands of Bulgarians traveled to Shipka by bus and with cars to commemorate the thousands of Russian, Romanian, Finnish soldiers and Bulgarian volunteers who fell for Bulgaria's freedom. These time no officials were spotted in the crowd of mostly young people nor did they deliver speeches as the country has been shaken by weeks of protest rallies against poverty, monopolies and politicians.